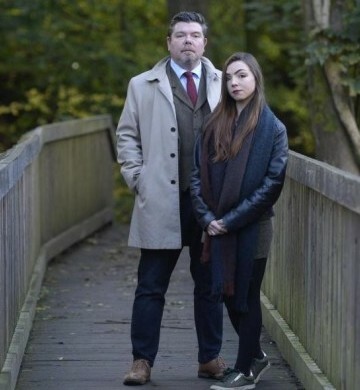 A journalist’s daughter who was the victim of a sexual offence has waived her right to anonymity in order for her father to expose a lack of police action against her attacker. Neil Mackay, who edited the Sunday Herald until shortly before its closure last month, wrote a piece for its surviving sister daily The Herald after police failed to follow-up an attack on his youngest daughter Caitie. Caitie, 20, had been subjected to a man exposing himself to her and masturbating after being followed in a park while walking to work on 20 July this year. But, despite Caitie contacting police after seeing her attacker staring at her the middle of the shopping centre where she worked just a fortnight later, the offender was never interviewed or charged over the attack and the family have now been told that, owing to his mental health issues, no further action would be taken against him. Now Caitie has given up her automatic right to anonymity to allow Neil to make public police and mental health system failings in her case. Since the 20 July offence she has been stalked at work up to 10 times by the man, but the shopping centre’s security team and management have told her he is not deemed a risk – leading to Caitie deciding to go public on the matter. Following the original offence, the offender was allowed to go home after police attended the shopping centre, with Caitie later finding out “after many phone calls” that officers believed the man was unfit to be interviewed, while the suspect’s family had refused to cooperate and his social worker could not be located. The police have since visited Caitie at the family home to explain that because of the offender’s apparent mental health issues there would be no further action from law enforcement, and that it would be unlikely for the shopping centre to ban the offender as he was not going to be interviewed, charged or prosecuted. In his piece for The Herald, Neil wrote: “This article would never have been written unless my daughter Caitie asked me to write it, and had the courage to waive her anonymity as a victim of a sexual offence. My daughter’s story raises serious public interest issues. “What happened to Caitie asks questions about how the police investigate sexual offences, whether we should believe claims from our government and police that dealing with sexual offences is a top priority, and also how employers protect young women who are victims of sexual crime. “I’ve been a journalist for 27 years – from crime reporter to newspaper editor – so I was able to spell out clearly to Caitie what going public would mean. I cautioned her against it, in fact. But she was adamant, and felt that if her father wrote about what happened then she would be safe. “I warned Caitie that there are always risks about speaking publicly, but also told her that many times during my career I had seen people only achieve justice because they spoke publicly. Neil, who now holds the position of writer at large for The Herald, has also raised his concerns with Scotland’s justice minister Humza Yousaf as well as the police. He added: “I’m lucky that as a journalist I can get the justice minister, and other figures of authority, on the telephone and tell them what is going on. Yet even then my daughter will be denied – as she says – both justice and protection.